Think Peridot may have it right albeit, as Cleo says, much nearer Rylands offices - a real fustian cutting area in the old days. Whalley street is just a suggestion. Looked at maps from 1928 through to 1965 and can't see any building that could be a public house, from Dalton Bank, Whalley Street Morley Street etc, I have even done the streets using Google Maps with no success. It was there Algy. I know for a fact that it was. saw it there many many times because my oldest sister lived on Church Street where Sainsbury's is now. then was Gaskell Street with the entrance to Rylands wire works and opposite side was a row of terraced houses rented to Rylands employees. at the end of that row, on Church Street was the Rylands laboratory entrance on one side and I think the entrance to the wages dept on the other side, then the Prince of Wales pub was on the opposite side in that street. Actually Greenalls gave it to the Liberal Party as a club for a peppercorn price. No no, algy dear, you are in the wrong place. Have marked with a x where The Prince of Wales would be. in School Brow not Gaskell Street. Cleo, your not going to believe this, before uploading the above map I had marked one showing the plot that you have marked with an 'X' on School Brow but decided it was wrong and so marked the above map in Gaskell street, what a plonker!, anyway I'm glad you identified it as you seemed to be the only person on here to remember seeing the pub, Well done Florence. WOW ! thanks to Cleo and Algy for tracking the whereabouts of the Prince of Wales down. If you superimpose todays landscape onto the map no wonder I can't recognise where I took the pic. It looks to be around the modern traffic light T junction between Manchester road and Church street, (where the Sainsbury's petrol station entrance is). The curved fronted building marked 'Rylands Labs' in the map above was last used as CJ Bent tool merchants to help you get your bearings. Next time I'm around there I'll get my bearings and take a 'now' picture. Again, amazing how much has radically changed in the last few decades. I visited Allen St and found a view that looks like Algy's picture. With my back against the Debenham's Golden Square complex, I couldn't stand as far back as I'd like to get the same perspective, but you can see where the pub stood. 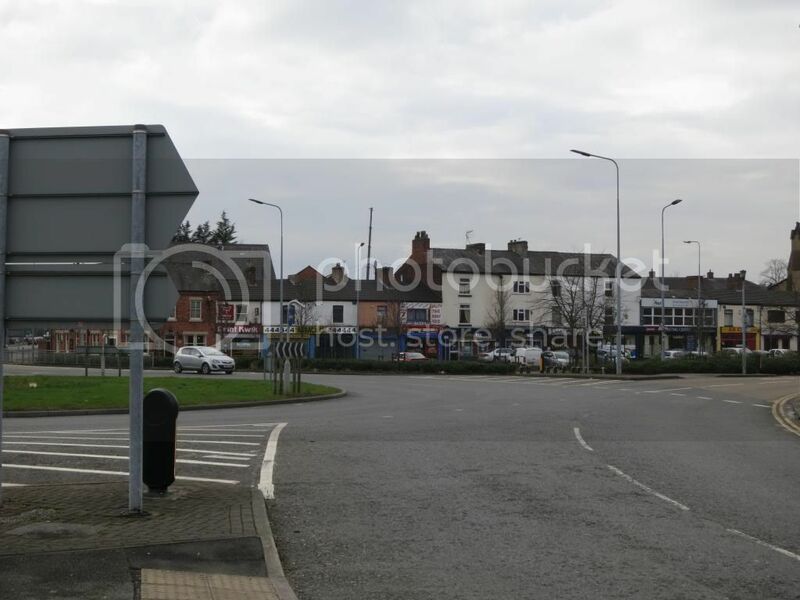 On Midland way past the bus station, towards Liverpool Rd between the traffic lights for the Car park and Legh St. left turn. Graz, heres one for your collection, 'The Blue Back' used to be at the side of the old fire station by the Potato Market. Any idea when the Raven was demolished? I think I must have been about 14, which would make it about 1983/4. Re the Prince of Wales I'm with you now and should have said further up from the main gate at St Elphin's Church on the opposite side off Manchester Road beyond the Lab. The Fustian Cottages were opposite the spot marked "Graveyard" and then the Pub was as marked beyond Rylands Lab. Bent's were in there for a time as a friend of mine works for them and I think were taken over by Bulldog Tools - not sure where their shop is now? So much has changed round there and I haven't been there for ages. I presume the Lab building is still there? I definitely saw it as the Prince of Wales and now it has been mentioned seem to remember it as the Liberal Club latterly and think it moved there from Bewsey Street. Re the Old Blue Back this was in Allen Street I think and opposite Jack Frodsham's workshop. I think a lady was the last licensee. The name comes from a Regiment of Foot Soldiers. Graz, this is how it looked prior to the new road being laid, this picture is one of T. Eyres, I shall leave it on until you pass comment then I shall remove it!. That's a lovely image, thanks for sharing it, pity it has to go ! Thanks for finding and sharing this soon to be extinct Raven. I have to say this is the saddest image in the whole thread up to now. On a happier note, I can just about make out the Devil's Grill in the background, scene of countless purchases of burger with relish ! Graz.... just to tug the heart strings a little more.... back in January last year when my mum died, I found this in my old bedroom... I too was a frequent sampler of the likes of the Demon Burger!! Cosgroves uPVC windows can be seen left of the 'Devils Grill' not sure if they're still there though, many years ago we had a bit of trouble with them when we cancelled a double glazing order. 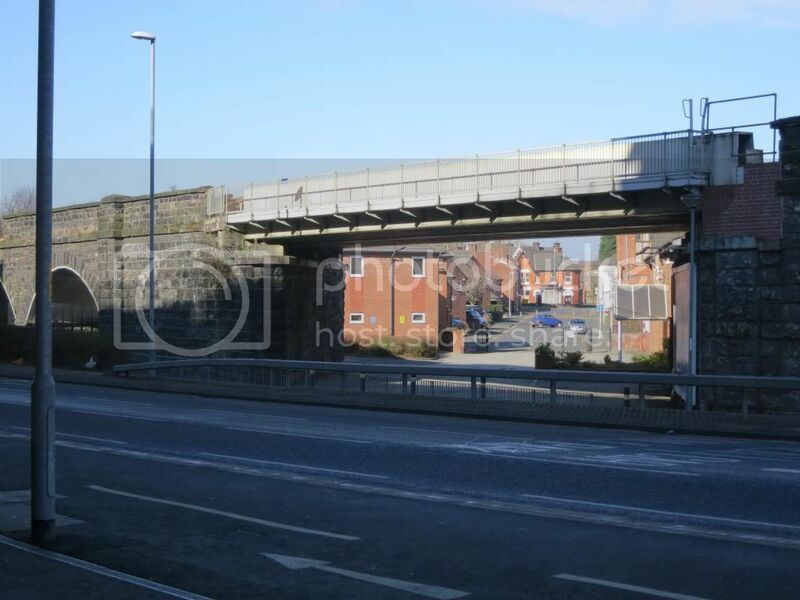 Graz, would you happen to have a photo of the 'Ship Inn' Liverpool Rd, Bank Quay and the 'Green Man' on the 'Green'. Wow, Baz, no offence meant here, but your dad looks like Tony Christie and your uncle very much like a young Des O'Conner. Beat me to it algy, was about to say that's Des O'conner and his brother. In his very younger days, Frank actually looked like Leonardo DiCaprio!!! With smiles like that I bet those two lads were a hit with the girls!. Cosgrove is now on Gainsborouigh Rd Algy. 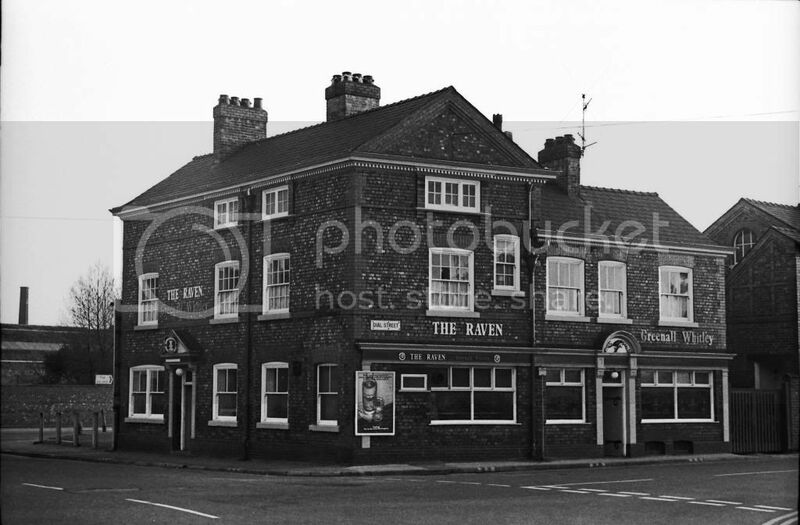 Dizzy... found this photo of the Old Quay Tavern.... is this the place you remember? ?